We’re very proud to announce that we took home two accolades at the PPMA Awards 2018. 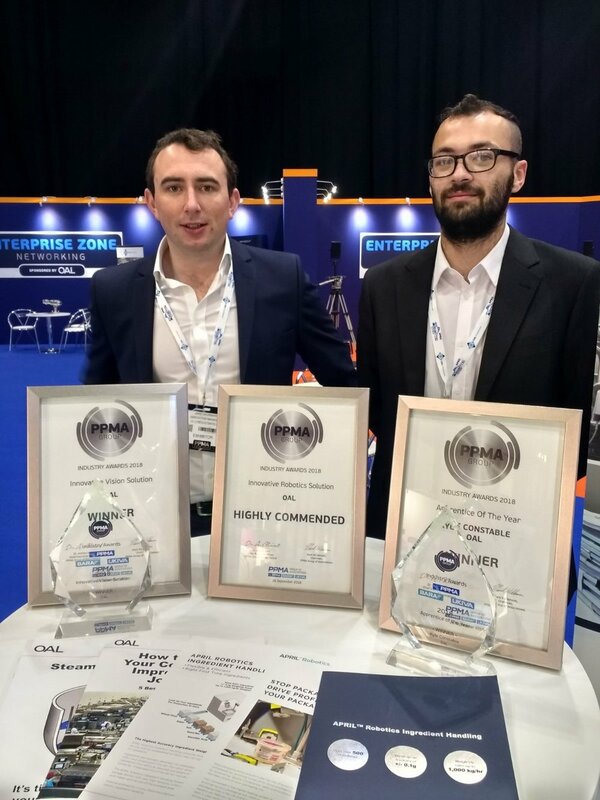 Our APRIL Eye system won the Innovative Vision Solution award, while Kyle Constable, Steam Infusion technical sales lead at OAL, was named Apprentice of the Year. We were also highly commended for our APRIL Robotics Ingredient Handling system! The awards recognise the finest examples of innovation, smart manufacturing and entrepreneurship in the UK food industry, and we’re delighted to have been acknowledged in three categories. APRIL Eye is the world’s first artificial intelligence vision solution. It fully automates the date code verification process to reduce the risk of product recalls and withdrawals caused by human error on packaging lines. The Innovative Vision Solution award celebrates equipment suppliers, system integrators or end users who have manufactured, designed or installed a clever, creative or innovative industrial solution. It’s fantastic that the PPMA appreciates how APRIL Eye can make a significant improvement to processes, safety, quality and efficiency and deliver cost savings to food manufacturers on their packaging lines. By combining machine learning and artificial intelligence, APRIL Eye transforms the traditional date code verification process, which relies on operators to check the date code is printed correctly. APRIL Eye removes the human error inherent in these boring, repetitive tasks by reading back the date code, fully automating the date code verification process. The system can deal with variations such as lighting, positioning, print quality and placement to eliminate errors, protect consumers and the brand while at the same time reducing labour costs and waste - it’s the full package! Acknowledging emerging talent within the food industry, the Apprentice of the Year award celebrates the most promising apprentice, and in particular their future leadership potential. Kyle Constable is a degree apprentice at OAL, helping UK and European food manufacturers adopt OAL’s Steam Infusion technology to ensure they maximise the benefits of the cooking process. With a strong background in the food industry having previously worked for Nestlé as a manufacturing apprentice, he is currently completing a degree in Food & Drink Manufacturing Operations Management at the University of Lincoln. The award is designed to encourage more young people to take up careers in the industry, a cause that Kyle takes very seriously as he represents a success story of taking an apprenticeship route to gaining a degree qualification within the food industry and uses this experience to mentor students as part of the OAL CSR programme. It’s wonderful for Kyle to be recognised for such a prestigious award as it endorses his hard work combining studies with great performance at the company. We’re really making a difference at OAL. Want to join us on this journey? Get in touch to find out more about our award-winning solutions or if you want to be part of a team that values training and development, have a look at our careers page today.